One of my pet interests is health literacy and its far-reaching impact on quality and access to healthcare. The issues surrounding it can almost be insidious in nature. Despite this, health literacy is typically only given superficial coverage in traditional training programs. Here in South Florida we have an especially diverse patient population with a higher than average percentage of those with limited English proficiency (LEP). It’s pretty intuitive, but LEP patients are (unfortunately) more likely to encounter barriers to health care and are associated with poorer outcomes than non-LEP patients. In part to address this, there was actually an Executive Order mandating “meaningful access” be given to LEP persons for Federally-funded activities (what, you didn’t think ‘meaningful use/access’ was limited to EHRs and the like?). Consequently, hospitals, clinics, etc. began incorporating translators and other language access services (LAS) as SOP (at least on paper) due to their receipt of Federal funding/payments. However, a funny thing happened on the way to implementation in community pharmacies – much as those pharmacies and the healthcare professionals that staff them are treated differently than similar entities/professionals in our system of health care…this mandate has been treated more as a voluntary compliance issue. What, if any, impact has this had on reimbursement or outcomes? The jury is still out. However, as a first step to methodically examine this issue, we conducted a national survey of availability and use of LAS in community pharmacies; the initial results of which have recently been published in the Journal of the American Pharmacists Association (JAPhA). Pharmacist responses to the survey ranged from descriptions of widely advertised and seamlessly integrated interpretation (verbal) and translation (written) LAS services to the (rarely observed) attitude of ‘if they’re in our country they should speak English’. Overall, we identified issues regarding awareness (e.g., about half of pharmacies with LAS capacities did not report making them known to patients), use of LAS (e.g., about 40% said they “never” used interpretation/translation tools), and workflow/time (e.g., a quarter of respondents said they simply lacked time to use LAS). Alternately, there were encouraging signs as pharmacies that did apprise patients of LAS availability used a variety of methods including in-store direct notification, signage, flyers, and targeted mailings. Additionally, more LAS products are becoming available such as Elsevier’s MEDcounselor Languages module, which advertises SIG translation and patient education materials in 14 languages. Another gem that area pharmacists have started using (albeit moreso in AmCare clinic settings) is the free MediBabble iPhone app. My understanding is that a future update will (ahem) include pharmacists in the introductions section. Unfortunately, our article “Community pharmacists’ use of language-access services in the United States” is behind a subscription wall, but I would be happy to answer any questions that I can. Disclosure: A couple years ago we received a grant from one of the quadrillion companies Elsevier operates for an unrelated research study. Inclusion of their product in this post is mostly due to timing (I just received an email about it), and should probably not be construed as a conflict of interest except for the most Mel Gibsonian of conspiracy theorists. Separately, this JAPhA LAS study was funded by a NSU President’s Grant. Going forward we are planning to study the LAS disconnect further, as well as possible solutions that may include tools such as automated LAS kiosks in pharmacies and online functionality as well as LAS availability notification via social media; funding source(s) TBD. Source: Feichtl MM, Clauson KA, Alkhateeb FM, Jamass DS, Polen HH. 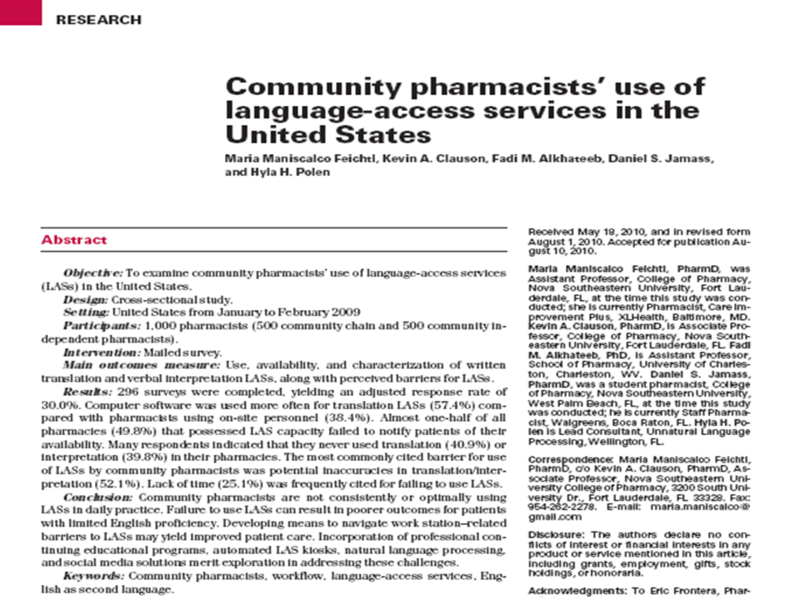 Community pharmacists’ use of language-access services in the United States. J Am Pharm Assoc. 2011;51(3):368-72.